Workstations and Workspace Solutions | Enkosi Pty. Ltd.
ENKOSI specialise in providing standard and custom designed workstations. Leaders in Australia for workspace solutions, all our products are designed and manufactured in house. Built from aluminium profile framing and laminated bench tops, ENKOSI’s workstations are suitable for a wide variety of applications and environments including industrial, manufacturing, assembly lines, and testing labs. 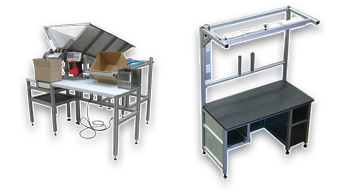 Our ergonomic workstations are manufactured from a light weight anodised aluminium profile. This provides the user with a safe stable design whilst presenting a clean aesthetic style. ENKOSI can collaborate with your team to design custom workplace solutions that are built to your specification.